Jottings on what makes life worth living. First a shock and then a rush of blood to my chest - a physical sensation of loss. What? The Barnes and Noble at Lincoln Center is closing? That can't be! Where will we go to check out the new books first-hand (even though we sometimes end up buying them on Amazon)? Where will we go for cards, gift-wrap, maps, magazines and calendars? What about the wonderful book signings, where I met my favorite theater director, David Cromer, and had the whole cast of Our Town sign my new hardcover copy of the play, after they performed a scene and generously answered questions from the audience? Where will I arrange to meet friends, if not "on the first floor of the Barnes and Noble, Broadway side"? It was more than a bookstore. It was a place where people came together - to buy books or just browse around and chat. It had become as essential to the community as a city park or other public destination. And it was leaving us. I recall when I first started going to this particular Barnes and Noble. It was when I was a law student at Columbia. This was a second career for me, so I was way older than my classmates, which meant no dates on weekends except with the X-Files on Fridays. I would often take in a film at the movie house on 68th and Broadway and then walk a block over to the Barnes and Noble to browse the new hardcovers, look at magazines, maybe get a cup of coffee. I don't drink - alcohol aggravates my asthma - so I don't hang out in bars. This was a place I could go to by myself, a safe place, and, most of all, there were books. At first I was unimpressed. I'm a snob, you see, having worked in the greatest of all independent bookshops, The Seminary Coop Bookstore, while I was a grad student at the University of Chicago. We were expected to answer questions with a knowledge of the extensive stock of titles, specialized academic disciplines included, and if we didn't have it, we'd "special order" it. We did it straight up - no coffee, just books. But I gradually warmed to the Barnes and Noble. 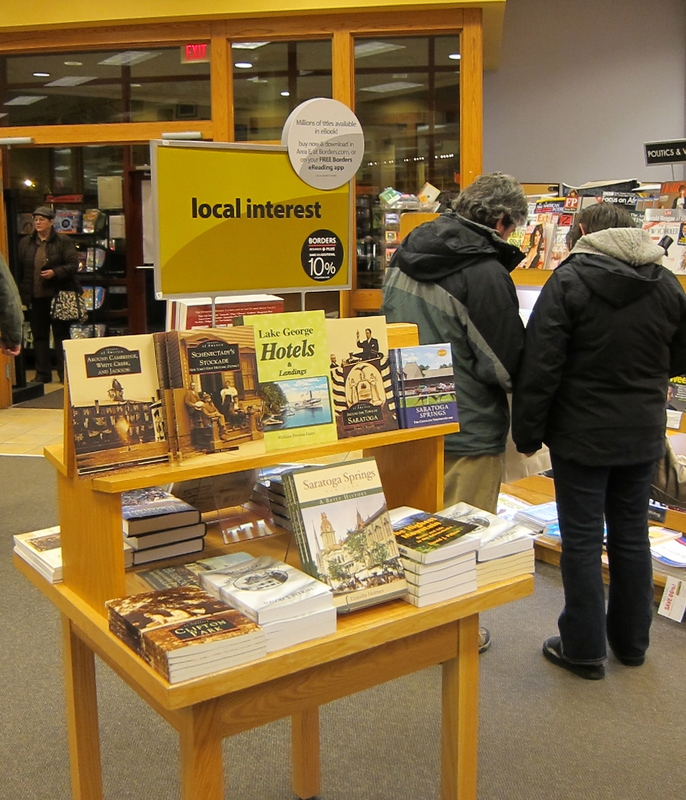 I recall when I started going out with Mr. H (we are now married and living happily ever after), we went to the bookstore to do research for a trip to Montreal. I found a lovely little hotel in one of the guidebooks, showed Mr. H the passage, and said: Okay, let's memorize this." He looked up from the guidebook and said: "You know, we could just buy it." I burst out laughing. As a poor student, I was so used to just browsing, it hadn't occurred to me actually to buy the book! And now we hear that Borders is closing its stores in Manhattan and all over the country, including the one we frequent in the charming town of Saratoga Springs, NY, where we rent a weekend apartment. We like Borders stores because they usually have a good local history section. When we travel to different cities, we make a point to stop at the Borders to look for books on the special history of the place, and we usually pick up some other reading for the trip as well. The Borders in Saratoga is a large brick structure at the center of the main street. Often, when we're strolling in downtown Saratoga, Mr. H will run in to to get the papers (which we also read online), while I wait outside with Darwin, our black lab. Darwin and I see all manner of people going in and out of the bookstore while we wait - old and young, hip and nerd. Musicians are often outside on the sidewalk, and there's a Seattle's Best with tables inside where people chat over books, news and coffee. It's a festive scene, rich with human interaction. With the bookstore gone, there will be a huge gap in the texture of the neighborhood. We all understand the economic difficulties in maintaining a physical bookstore when everyone, including me, is reading on iPads or Kindles. But I still buy hard-copy books, and not always online. Sometimes I can't wait for the mail, I want to have the book in my hands right away. When Mr. H and I make the 3-hour drive up to Saratoga, we listen to audiobooks from my iPad through the car speakers. We invariably end up going into a bookstore and buying the same book so we can look at the drawings and pictures and look back at some passages I might have missed while napping. After all, you can't listen to Endurance, the spellbinding story of Shackleton's adventure in Antarctica, without wanting to see a photograph of the tall ship trapped, surrounded by ice, or hear The River of Doubt, without wanting to see what Teddy Roosevelt looked like writing his articles for Scribner's in the middle of the Amazon jungle sitting at a little portable table while covered up by gloves and mosquito netting. And you can't listen to these books without wanting to have your own copies on the shelf forever because they are so, so great. Going to bookstores is part of our lifestyle and they offer a special place for people to gather. Will physical location become less and less necessary as we become more digitized, so that we don't ever need to leave our homes to bump elbows with strangers over coffee, books and records? (Don't get me going over the loss of Tower Records). We may end up like the Krell of Forbidden Planet, who became so technologically advanced that they had no need for physical instruments and withdrew into their own minds, ultimately to destroy themselves and their civilization with their own terrifying monsters from the id. Well, maybe it won't be that bad, but it is a huge loss. And I am sad. Nice reference to Forbidden Planet. I worry that people aren't interested in finding a balance between the virtual and physical worlds, which is what is needed if we are to keep our humanity intact. And with all of the emphasis being placed on science and technology, and not on the humanities, perhaps the lives of our descendants will be sad and empty ones. I worked at a great indie too (and even longer ago, at Tower), which makes it strange to miss the chains. As I'm sure you know, there is nothing better than hand-selling a book that is just right for a live customer seeking help. We will soon be left with widely dispersed used book sellers and specialized gift shops. Maybe they could do a sequel to You've Got Mail, where the big, "evil" Fox Books finally closes it's doors too. Tom Hanks and Meg Ryan could try their hand at strictly coffee roasting. There were no bookstores where I grew up, and my birthday request from ages 10 to 13 was for my parents to drive me to the B. Dalton bookstore in Mobile, AL (about 45 minutes away) so I could spend my birthday cash. Later, when I lived in Mobile, a Barnes and Noble opened. I remember the first time I walked in. It was a paradise, and a little liberal oasis in a very conservative town. I don't live there anymore, but I'd be sad if it went away. Such a beautiful, insightful, and warm tribute to bookstores, and to Borders in particular. Even in the world of "big-box stores" such as Barnes & Noble and Borders, we find differences in personality. Borders has seemed to be the quirkier of the two, in my view, and I have been drawn to its quirky personality, though I like B&N very much for other reasons. I love the atmosphere of so many bookstores on a weekend -- the time I go to them mostly -- when people are hanging out, having coffee and tea and treats, and browsing and buying. As I begin to get into the world of audio books more and inspired even more now by your piece, I need to think about how I can support our brick-and-mortar stores when I buy and download books onto my Droid (and soon, the iPad I plan to purchase). B&N has had such an inviting plan with its Kindle. The physical presence of these stores, from the indies to the giants, is very important to our communities. I don't want to see Main Streets, city neighborhoods, and suburban strips dominated by so many banks and fast-food places while the bookstores are gone. Sad for you and Mr. H. You're right about Endurance -- only the hardcopy will do. Nice. This is hardly a new issue: indy bookstores have been struggling for a long time. And while I love the Co-op Bookstore as much as anyone, it has a certain advantage relative to its business model: a steady stream of geeks, dweebs and dorks (I was proud to be one of them). Borders seemed unwilling or unable to adjust its own model. So is the issue here a business not succeeding in a competitive economic context, or the larger question of whether, as structured, certain lovely things in life are doomed? Thanks for all your great comments! I should add that the Seminary Coop Bookstore in Hyde Park is still thriving - yes due to us geeks - and can be found online at www.semcoop.com. And the closing of B&N at Lincoln Ctr was apparently because the rent was too damn high at that location. It will be replaced by a discount clothing store - not exactly the same ambience. One of my twitter friends said that her husband proposed to her at that B&N. I doubt that would happen at the discount clothing store! Borders is bankrupt because it was horribly mismanaged. Whatever the cause, I'm still sad to see them gone. If we rely entirely on private corporations for certain things, then when the business is mismanaged, or there is a downturn in the economy, or technology renders the service moot, then those things will disappear, that's just how it is. Careful urban planning, with an eye to residents' quality of life, could make sure that certain amenities are available - grocery stores, cleaners, bookstores. Maybe there could be special rent or tax setoffs for certain kinds of business. But that helps only to a point and can't help a store that consumers have determined they don't need anymore, however nice it may be. The worst thing is to live in a place and slowly see the good things disappear around you because no one is paying attention. It occurred to me that in other areas where the Borders and Barnes and Noble stores are on located in malls or strip malls along the highway, the shared social experience I spoke of is greatly reduced because the dynamics are so different than when the bookstore is centrally located in a city or small town. Well, there's still baseball (which is now way too expensive to enjoy in person in NYC). You're absolutely right. On L.I., Borders is typically grouped with Office Max, Sport Authority and other box type chains. Pre-Borders, independent bookstores were found on Main Streets in towns and were, on a smaller scale, similar to your Seminary Coop. Those wonderful places, which actually smelled of books, have largely disappeared. So sad that bookstores may become things of the past. I love the feeling of walking into a bookstore. It's a feeling of comfort, it totally relaxes me. Even though I do own a kindle (it was a gift that I wasn't expecting), there is nothing like wearing out the binding of a great book, and being able plop it on your shelf afterwards for all to see. Thank you for putting into words exactly the way I feel. Our Borders here in Allentown is closing after 12 years and I am at a loss. how funny, it's such a small world- Just like you I was heartbroken when I heard about The lincoln Center B&N and The Saratoga Borders! I was a fan of both of those locations for many of the same reasons. Just an added thought to this post with the disclaimer that I live overseas in a land without Borders. :) Yet, my daughter-in-law worked at Borders during her first two years at uni, and her thoughts were that Borders went under because they were grossly mismanaged. She's a hydro-electric engineering major in her graduate year, so no 'dummy' just shooting her mouth off. So I do appreciate another angle to this sad story, an insight into what may just be more an overall case of bad bookkeeping rather than lack of support by bibliophiles. 1st Amendment lawyer, an enthusiast of news, art and science, married to my favorite writer, have a black lab dog named Darwin, Ph.D. pre-modern Chinese Literature, born in U.S., mother from Korea, father from India, both gone now.